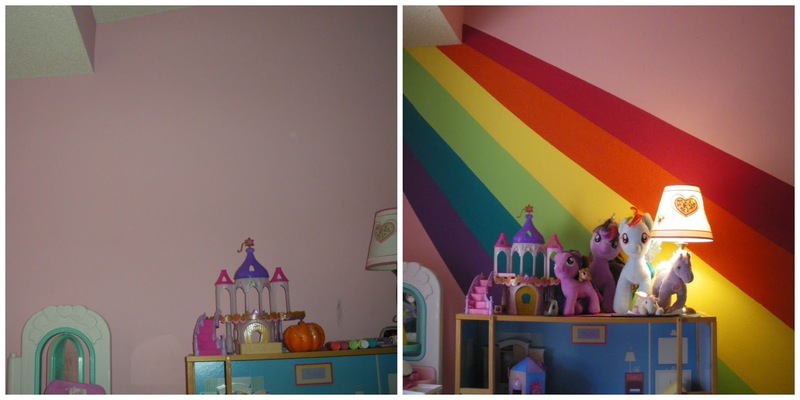 I was inspired by the rainbow wall in Primitive & Proper's American girl nook. A perfect mural idea for my Rainbow Dash lover. Click over for a great tutorial on how-to. I think I might love her room more than she does! Its colorful, its fun, and its totally personalized to her. Can you believe this dollhouse was next to the trashcan on trash day? Ok, its a bit old and dated, but its structurally sound, easily cleaned up, and works like a charm for my daughter's playdates. Its also a great shelf for her lamp, clock, and random toys. My son asked if I could paint something on his wall next. Sure, I said, what would you like? Wow, that's some rainbow! What a lucky little lady to have such a super crafty mom!